I think our first order of business here has to be to acknowledge that Plectranthus verticillatus and Pilea nummulariifolia are not, in fact, identical. 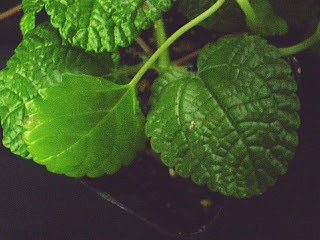 More than that, they're not even cousins - Plectranthus is in the Lamiaceae (mint) family, while Pilea is from the Urticaceae (nettle) family. By this point you are probably wondering why this should matter to you. It probably really doesn't. Also it's not likely that it ever will. In fact, you could probably have gone your entire life without knowing this and been just fine. But where's the fun in that? We're all about the learning here at PATSP, even if it's the kind of learning that could only ever come in useful on "Jeopardy" or in a botany class. The first thing you notice is that the venation (pattern formed by the veins) is different. 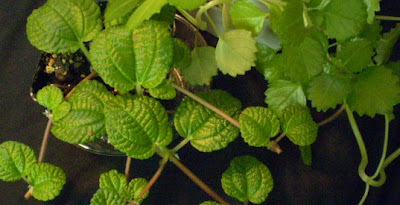 Pilea has three heavy veins on each leaf that run from the base most of the way to the tip (they do not, in fact, actually reach the tip of the leaf, which is easiest to see in the close-up picture), whereas Plectranthus has a single main vein down the center, with symmetrically-splitting branches. Is this important, you ask? Well, again, the answer is no, but venation is one of the ways that relatedness is determined, in houseplants, which makes it a little bit relevant. If somebody comes up to you with two plants you've never seen before and asks which one is the Pilea, you now have a basis for making an educated guess: it'd be the one with the three parallel veins, two of which don't get all the way to the end. And, if you can guess a genus, you can make educated guesses about how to care for them, whether or not cuttings will root, and that sort of thing. And this sort of thing comes up a lot more often than you'd think, if you're at all serious about growing houseplants. But hey. How do they grow? Glad you asked. So as you can see, this one also works fast. Since I didn't really have anything to go on when I got it, not even knowing what it was for sure, I went with my all-purpose default treatment: bright indirect light, normal humidity, water when about halfway dry, room temperature. You'd be surprised how many plants that will work for. After figuring out what it was, I didn't change any of the treatment except for trying to keep it a little wetter, and this has worked out fine. The official references will tell you that it needs high humidity, and I suppose that's possible, but I've never gone to any effort with mine, and it's been okay, so I'm going to call that one pending. A little more light might be a good idea too, considering the internodal (between the leaves) distance on some of those, though in that case I'm doing about as good as I can. But really, not that difficult, all things considered. I'm becoming quite fond of the Pilea family as I get to know them. 1 To put this into some kind of perspective: at the class level, human beings belong to the class Mammalia. So what this is suggesting is that the two plants under discussion here are about as related to one another as people are to bats. Or deer. Or mongooses. Or bears. Or whales. So you see how I'm using some poetic license here, talking about the plants as being "cousins." Seeing as how I blew the strict-accuracy bit from the word "identical," I think this is not really a big deal, though. 2 There are really an awful lot of plants in my head that I associate with particular relatives, presumably because the relatives in question had the first specimens of these plants that made any kind of impression on me. My mom's mom gave me a painful introduction to Opuntia when I was very little (hate glochids). Dad's mom was Aloe vera, Schlumbergera, Sempervivum, and Haworthia attenuata. 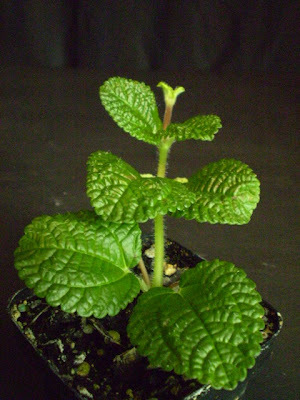 Great-grandma had Plectranthus verticillatus, or Pilea nummulariifolia, whichever it was. A step-grandmother showed me Sedum morganianum and Gynura aurantiaca for the first time. One of my aunts had an impressively exploratory Syngonium. Not every relative, or every plant, has an association like this, but it has driven a few of my purchases, over the years. 3 Which can be just as dangerous as the cliché would have it, but only sometimes. Sometimes a little knowledge can be a dangerous thing, and sometimes knowledge is power. You never really know which direction it's going to go, but I think power has a slight edge over dangerous. 4 And, for the record: I almost never know where these profiles are going to go when I start writing them. It's been convenient that these last two both wound up going to a technical, nomenclaturey-type place, because this was something that needed to come up sooner or later, but that wasn't really what I was expecting to happen when I started with the identical cousins idea. The original idea was actually to do the good twin / evil twin thing (There was a spell in the mid- and late-90s when I followed "Days of Our Lives" in a regular, if not serious, way, which may explain something), but I got hung up for days on which plant was good and which one was evil, and finally had to pick some other direction to go with it. You don't have to care about any of this, of course; I'm just saying, that's what it's like backstage here at PATSP. 5 Actually, it was less a cutting and more a kind of a little bit of a theft. Technically. I am, under normal circumstances, very much against people taking plant material without asking, from wherever, and particularly so when it's the theft of plant material which is for sale. And had it been aaaaaaaaanybody except for the particular big box retailer it was, I wouldn't even have entertained the idea. But I am angry with this particular big box retailer, and that led me, at that time, to excuse taking the cutting. I'm not sure whether or not I'm sorry. I never said I was a saint. Also I feel compelled to add that there was no indication anywhere in the vicinity of what the price was supposed to be for this plant, which doesn't excuse or explain anything but somehow figured into the rationalization at the time. I worked hard enough in Botany class to get an exemption from the exam and I haven't looked back (at Botany) - It is kinda cool that two organisms can evolve to be so similar in form. yes, what i meant by uses is applicable uses for us. i thought it could have some "uses" since there are lots of plants belongs to urticaceae that are useful. 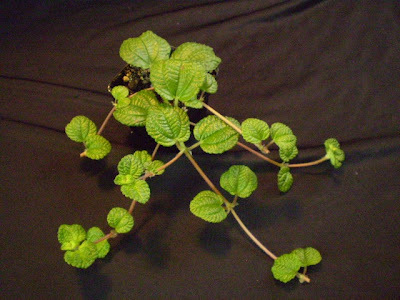 i have read some writings in the internet about this plant and most tells that it is used as ornamental plant, but one of them ( https://plants.ces.ncsu.edu/plants/all/pilea-nummulariifolia/ ) claims that the leaves are edible and can be made into tea, but there is no further explanation about what is beneficial from the tea made so i guess that it might just gives a taste of tea..